You are here: Home / News / Enter our Facebook Contest! Click the icon above to be taken to our Facebook page to enter this contest. 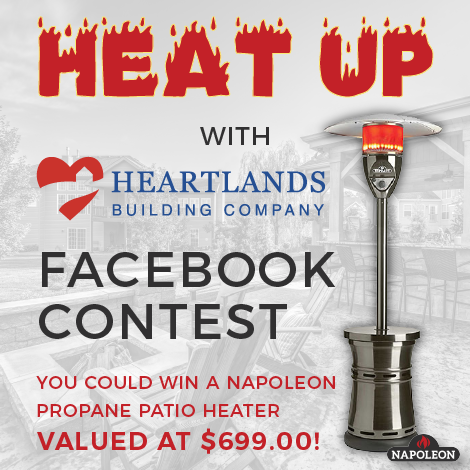 Facebook Contest | Win a Napoleon Propane Patio Heater! The winner of this Facebook contest receives a stainless steel Napoleon propane patio heater, valued at $699.00! Don’t miss this opportunity to extend your time on the patio this winter! LIKE our Facebook page, Heartlands Building Company. Then LIKE, COMMENT, and SHARE the contest post on the Facebook page. Contest ends once the Heartlands Building Company page reaches 1,000 LIKES. Heartlands Building Company will then draw the winner and contact him/her via Facebook direct message that day. This Facebook contest is called “Heat Up with Heartlands” and shall be in force until the Heartlands Building Company Facebook page reaches 1,000 likes. Heartlands Building Company is conducting this contest. The Facebook contest is open to all the residents of Missouri and persons above the age of 18 years are eligible to participate in this contest. There is no entry fee and no purchase required to participate in this contest. By entering this contest, an entrant indicates his/her agreement to be bound by all these terms and conditions mentioned herein. Only one entry per person accepted. Closing date for entries will be when the Heartlands Building Company Facebook page reaches 1,000 likes. After this occurs, no further entries to the contest will be permitted and accepted. Heartlands Building Company will not accept responsibility for entries not received in time for whatever reason. Heartlands Building Company reserves the absolute right to cancel, discontinue, or terminate the contest at any time or to accept or reject any or all entries at their absolute discretion without giving any prior notice and/or without assigning any reason whatsoever. Heartlands Building Company shall not be responsible for any loss. 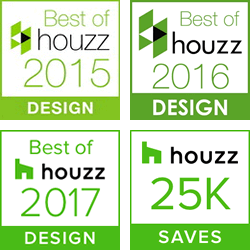 Heartlands Building Company is not responsible for inaccurate prize details supplied to any entrant by any third party connected with this contest. The prize is as follows: A Napoleon stainless steel gun metal propane patio heater, valued at $699.00. The prize is as stated and no cash or other alternatives will be offered. The prizes are not transferrable. Prizes are subject to availability and Heartlands Building Company reserves the right to substitute any prize with another of equivalent value without giving notice. The winner will be chosen at random by software from all entries received and verified by Heartlands Building Company. The winner will be notified via direct message on Facebook within five days of the closing date. The decision of Heartlands Building Company shall be final and binding. If the winner cannot be contacted or does not claim the prize within 14 days of notification, Heartlands Building Company reserves the right to withdraw the prize from the winner. Heartlands Building Company will notify the winner when and where the prize can be collected/is delivered. The winner will have to provide his/her identity proof at the time of collection of the prize. Heartlands Building Company’s decision in respect of all matters to do with the contest will be final and no correspondence will be entered into. The winner agrees to give his/her consent to Heartlands Building Company for the usage of his/her name and image in any publicity material of Heartlands Building Company. This promotion is in no way sponsored, endorsed, or administered by Facebook or any other social network. The participants in the contest will be deemed to have made themselves aware of the terms and conditions as set forth herein. The contest is void where prohibited or restricted by Law. Heartlands Building Company shall not be liable to provide any free prize/s and or compensation to any participant in an event the contest is held void. If you have any questions regarding this Facebook contest, please contact us at 636-728-0003 or info@heartlandshome.com. You can also message us on our Facebook page!